Kylie Jenner takes after her older sister Kim Kardashian in many ways especially when it comes to fashion. Recently, Kim K was spotted imitating Noami Campbell's 90s five original catwalk looks and looks like Kylie is all set to follow. The 21-year-old posed with a pair of Matrix-inspired crystal-studded sunglasses and a piece of dazzling crystal Choker along with some pointed Gianvito Rossi pumps, yes they were in crystal too. The fashion mogul posted a picture of herself on Instagram along with a sarcastic caption, "My Friends: Let’s Have A Chill Night, Me:..," where she is seen squatting like a pro in a cropped grey tracksuit from the K Label. 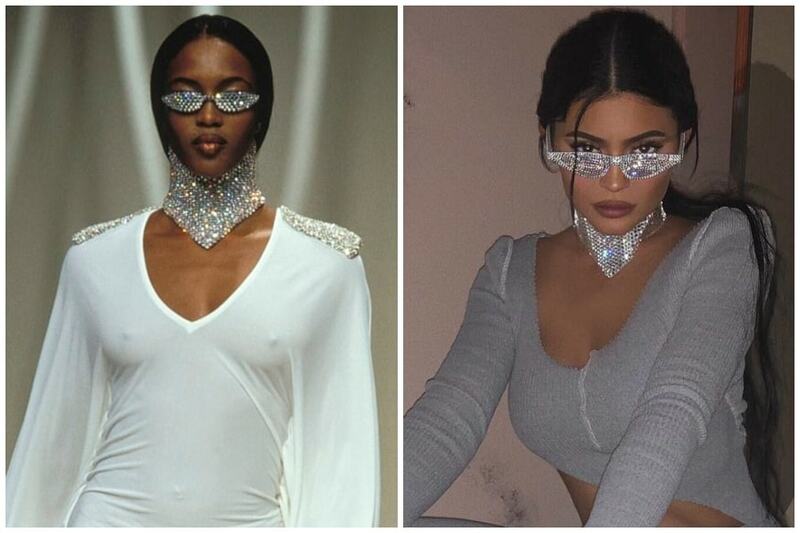 But it turns out that Kylie isn't the first to flaunt this trend as a few hours later, the iconic supermodel Naomi took to her Instagram handle and posted a picture of her 1995 catwalk in Paris where she is seen flaunting crystal sunglasses and choker at Rifat Ozbek's runway show. We already know how supermodel Naomi was at the top of her runway game in the 90s and was every designer's favourite showstopper, so it actually isn't surprising that fashionistas around the globe want to channel Naomi's iconic styles once in a while. Jenner's blingy glasses were customised for her by Los Angeles-based designer Michael Ngo, according to her Instagram page. Earlier Kim Kardashian made an appearance in different vintage numbers and fashionistas around the world seemed to have a Déjà vu due to the uncanny resemblance between Kim K's outfits and Supermodel Naomi Campbell's 1990s catwalk looks. Not once but five consecutive times the reality star was seen emulating Noami Campbell's runway originals. 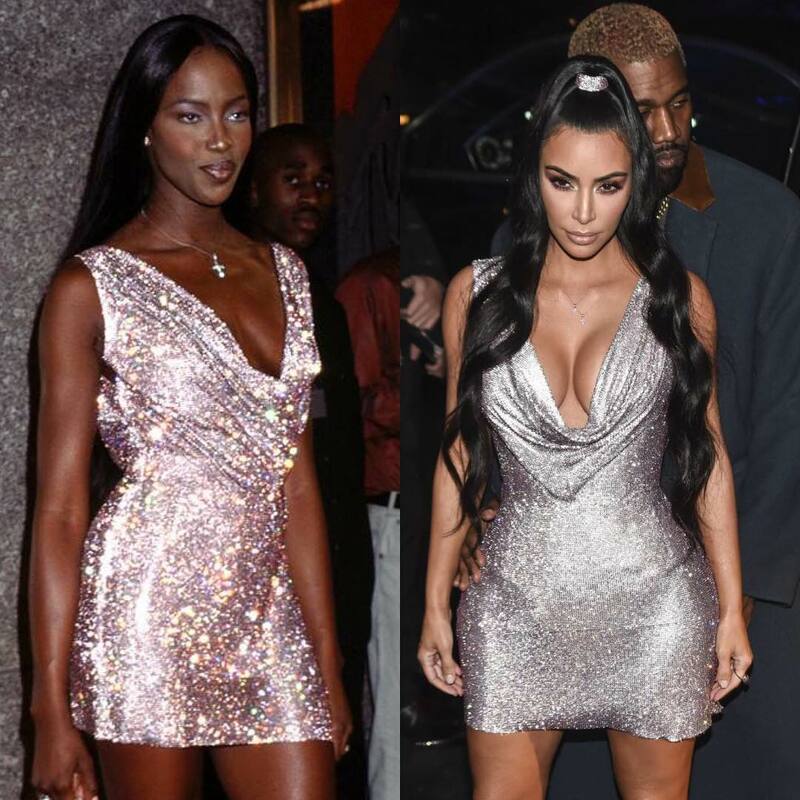 It all started in 2018 when Kim appeared at the Versace runway show in Naomi Campbell's 1997 sparkling chainmail mini dress. Call it a fashion faceoff or Kim K's and Kylie Jenner's homage to Naomi Campbell's original numbers, we love how the style icon's outfits and trends are making a comeback.